Victim of the model policy. 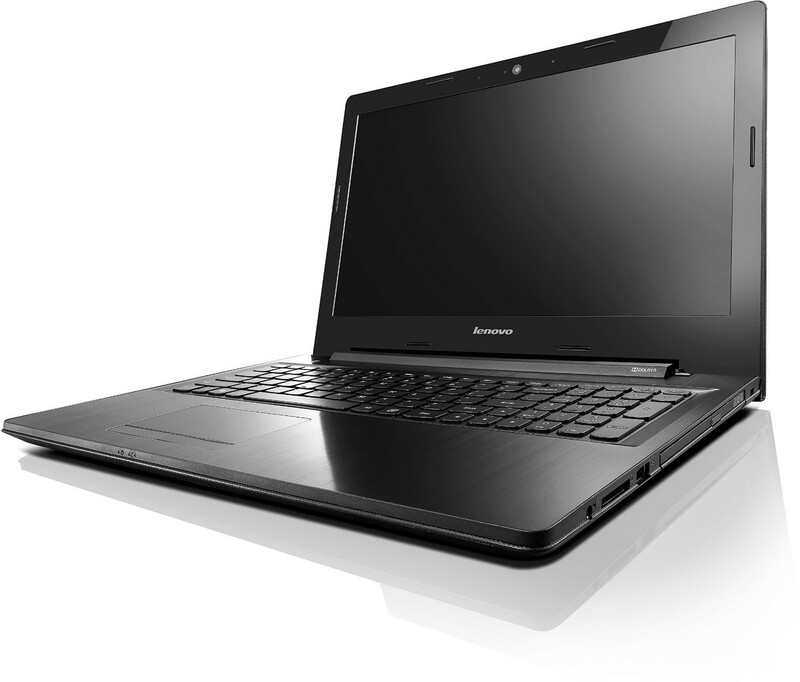 Lenovo's new Z50-series offers current and well-implemented mainstream and high-end technology for a small price but also combines it with components that are used in devices for 500 Euros (~$662). Are the display, input devices and case worthy of the 750 Euros (~$993) price tag? Lenovo's Z50-70-series consists of several black and white models starting at 500 Euros (~$662) that share the same case, but there are several different combinations of CPUs, graphics cards, memory and storage drives. A complete list would go beyond the scope of this review. Looking at the product range of a major mail order company, there are the Kaveri models AMD A10-7300 (4x 1.9-3.2 GHz, TDP 19 W) and A8-7100 (4x 1.8-3.0 GHz, TDP 19 W) that are combined with an AMD Radeon R7 M255 (2 GB). If you prefer Intel processors, you can combine i3, i5 and i7 Haswell processors with the dedicated graphics cards Nvidia GeForce 820M and 840M. 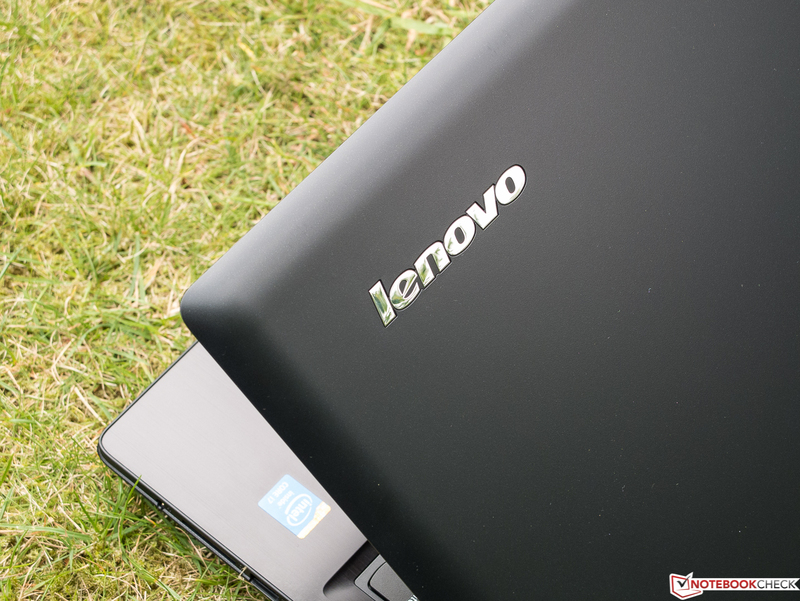 SSDs are not available; Lenovo uses conventional drives or hybrid drives with 8 GB SSD cache and a capacity between 500 GB and 1,000 GB instead. The memory equipment is between 4 and 8 GB. Some retailers also list configurations with the 1366x768 resolution, but we could not find any evidence for that. 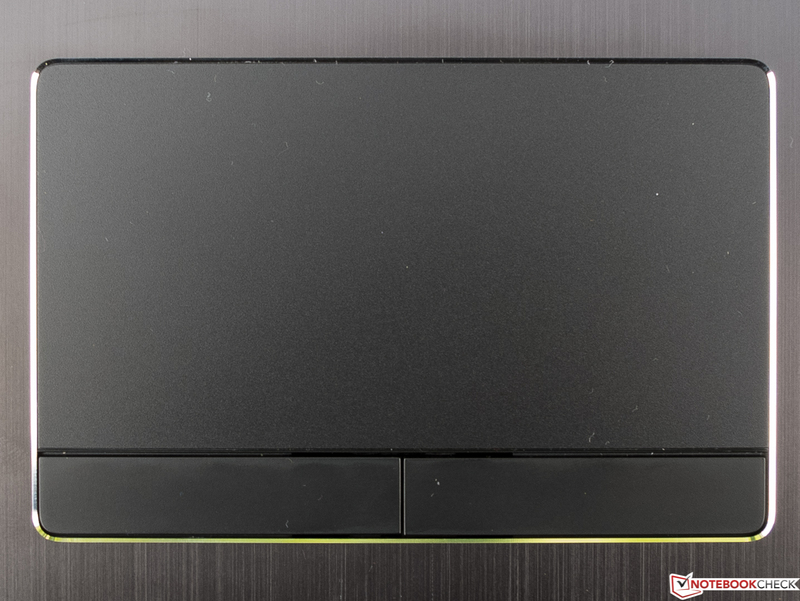 We expect that every local Z50-70 model uses the glossy TN Full HD panel from our review sample that is equipped with a fast Intel Core i7-4510U (2x 2.0-3.1 GHz, Hyper-Threading, TDP 15 W), 8 GB RAM, a dedicated Nvidia GeForce 840M graphics card as well as a 1 TB hybrid hard drive. The comparison devices for our review unit are similar in regard to the hardware equipment and price. 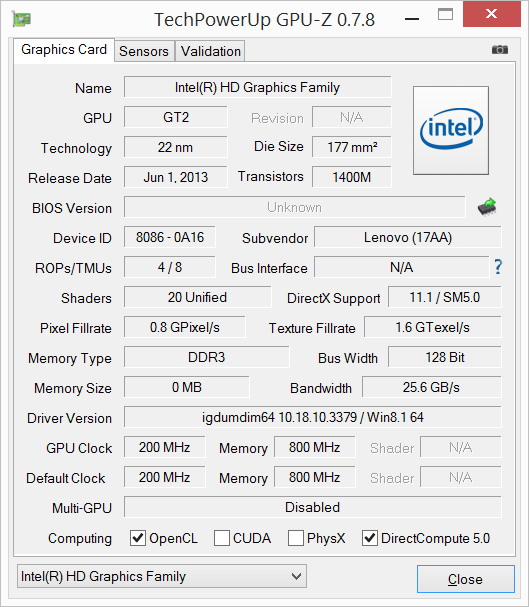 The MSI GP60-2PEi585 that we reviewed in June 2014 uses an Intel Core i5-4200H (2x 2.8-3.4 GHz, Hyper-Threading, TDP 47 W) and the same GPU, but only with 2 instead of 4 GB dedicated memory. 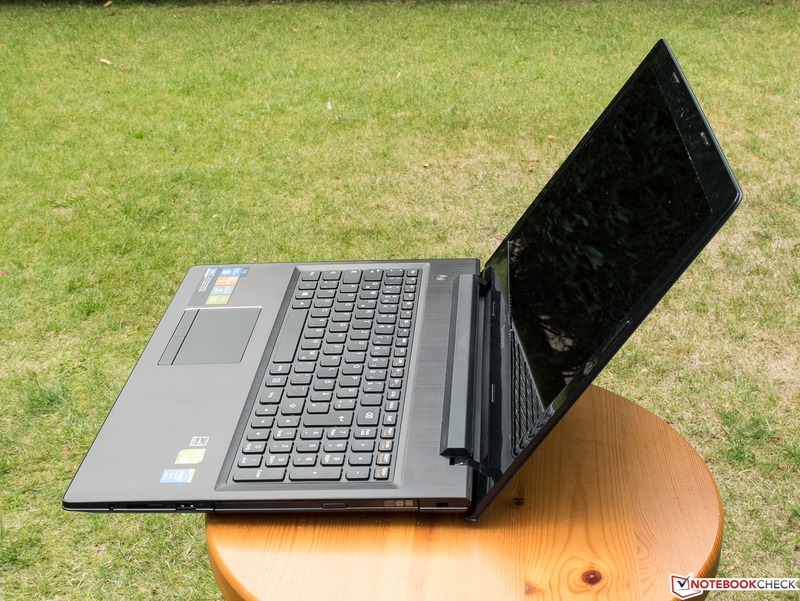 The Acer Aspire V5-561G, however, uses a combination of Intel Core i5-4200U (2x 1.6-2.6 GHz, Hyper-Threading, TDP 15 W) and AMD Radeon R7 M265 graphics card. All three notebooks in our comparison have TN displays with 1920x1080 pixels, but the two rivals from MSI and Acer have matte surfaces and conventional hard drives without an SSD cache. All three devices use the operating system Windows 8.1 and weigh around 2.4 kg. 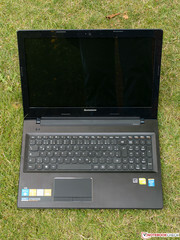 The Acer costs around 700 Euros (~$927), the Lenovo 750 Euros (~$993) and the MSI 800 Euros (~$1059) at the time of writing. 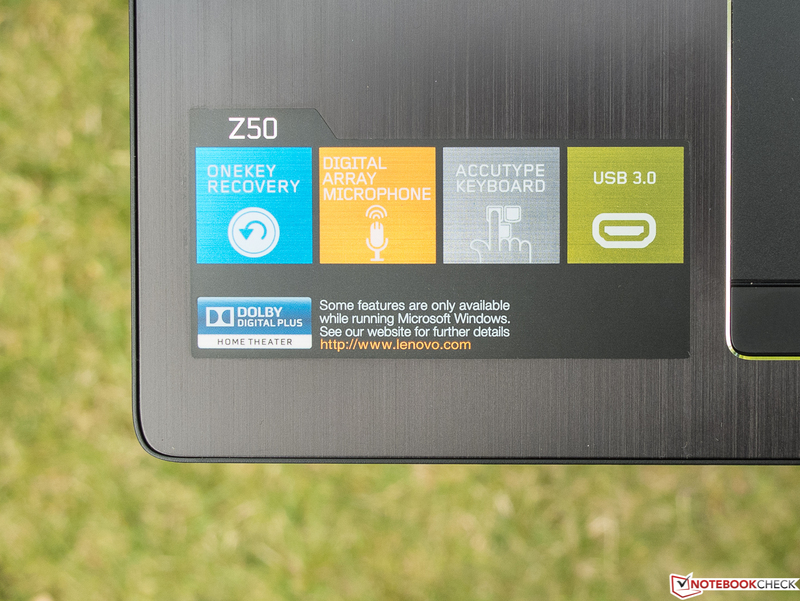 The case of the Z50-70 is completely black, mainly made of plastic, and it has a futuristic and angular design. The slightly brighter display cover is matte and shimmery, the top of the base unit has a brushed metal finish that attracts fingerprints. The display frame is glossy; the bottom has a knobbed pattern to improve grip. You don't need a whole lot of force to twist the base unit, which results in inconvenient creaking sounds. The same applies for the flexible display, push on the back and you can see picture distortions at some spots. The hinge keeps the display well in position and just slightly bounces during sudden movements, for example, in a car or on a train ride. 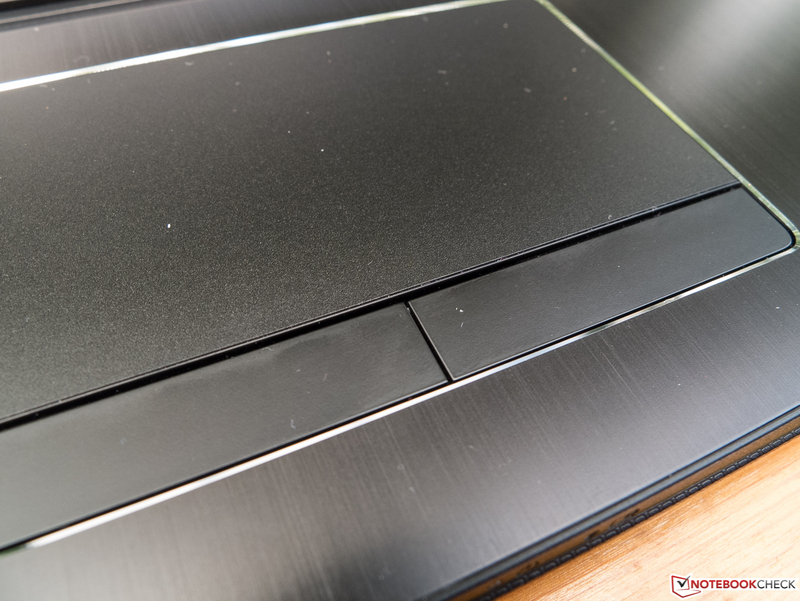 We could not see any obvious build quality flaws like protruding edges or uneven gaps, only the maintenance cover was not perfectly integrated (also see Maintenance section). 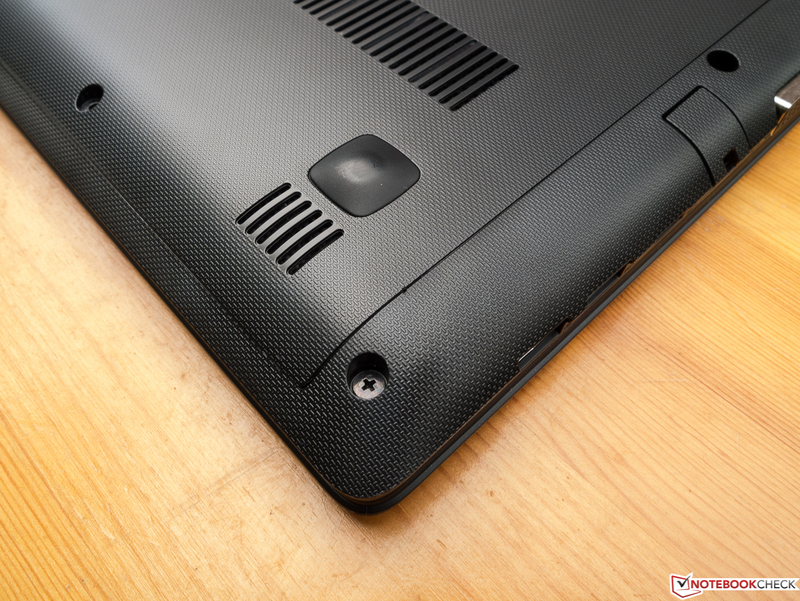 As is often the case with mainstream notebooks that share their case with much less expensive versions, the connectivity cannot really keep up with the expectations for this price range. 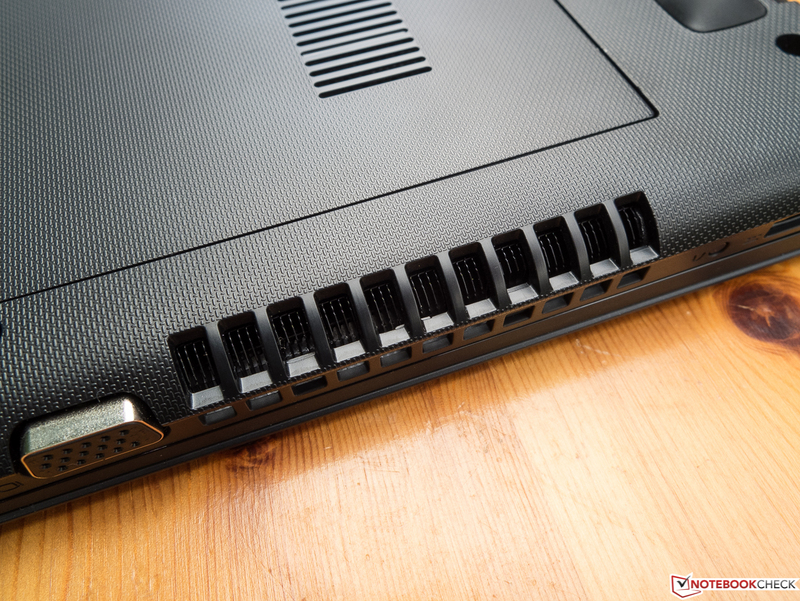 There is only one USB 3.0 port, and otherwise you just get the essentials. The ports are also located very far to the front, so attached cables and devices can be disturbing when you use an external mouse. Wired LAN is available via fold-out Ethernet port, but you can obviously use wireless connection as well. The Atheros Communications AR9565 Wireless Network adaptor neither supports 5 GHz networks nor the latest Gigabit-WLAN IEEE 802.11ac, but at least Bluetooth 4.0. The signal quality in the individual setup of the author was average with an increasing distance from the router and several architectural barriers, which might just be an issue if you have to deal with a low signal quality. Apart from the power adaptor, quick-start guide and warranty information, there is nothing in the box, not even installation or recovery drives. This is standard in this price range. 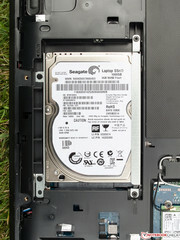 The maintenance cover is secured by three screws and grants easy access to the HDD, fan, WLAN module and memory slots. 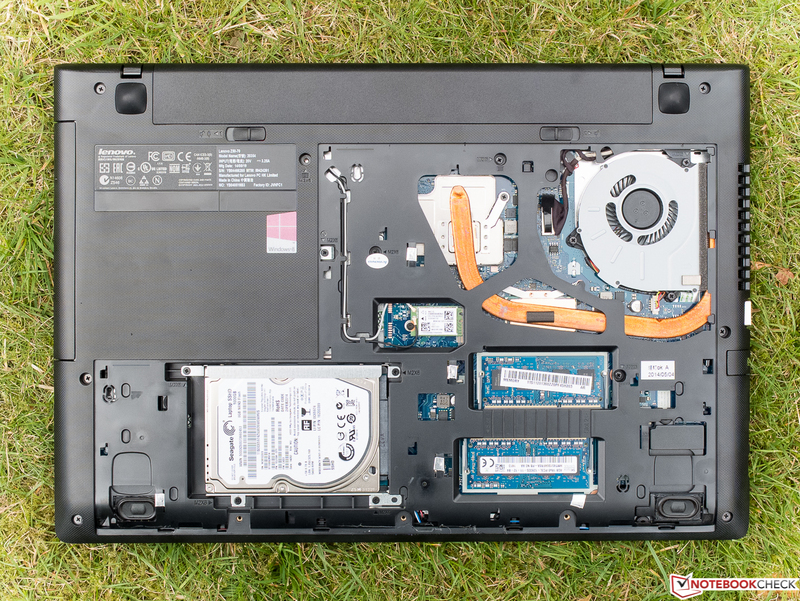 This means it is easy to maintain or upgrade the notebook – exemplary. 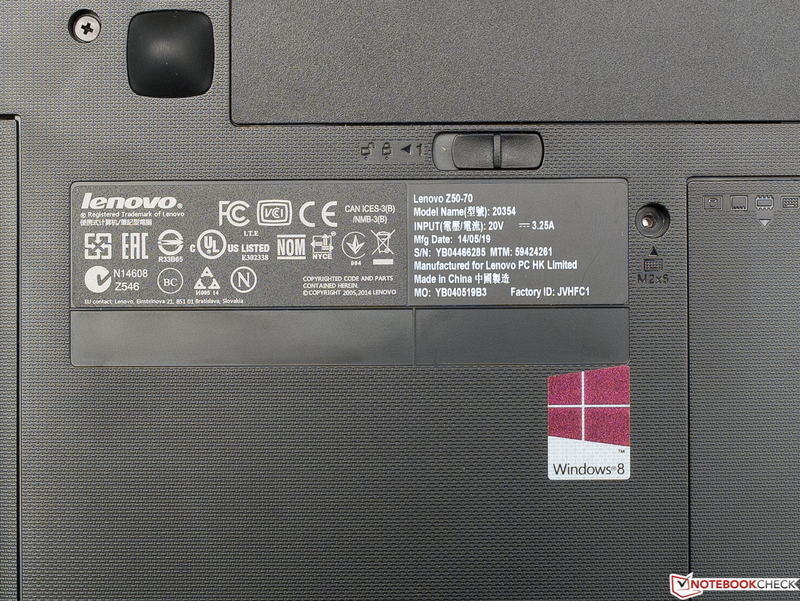 Lenovo's information about the manufacturer's warranty is contradictory. The product page says two years, but if you enter the serial number here, it says one year. 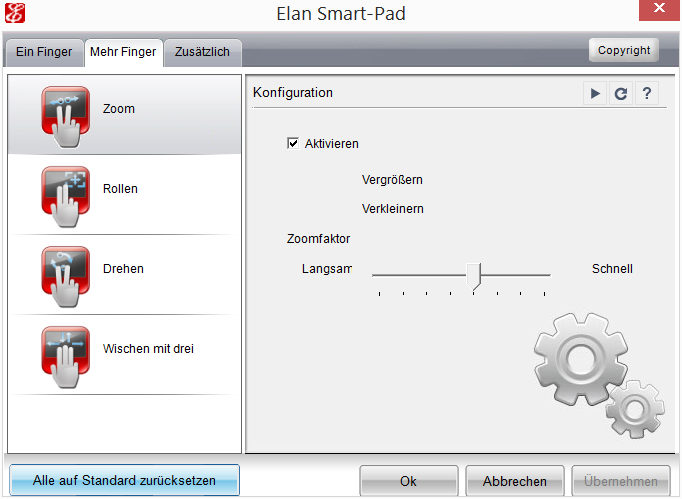 The first picture in the gallery on the right side shows the different warranty extensions you can purchase. 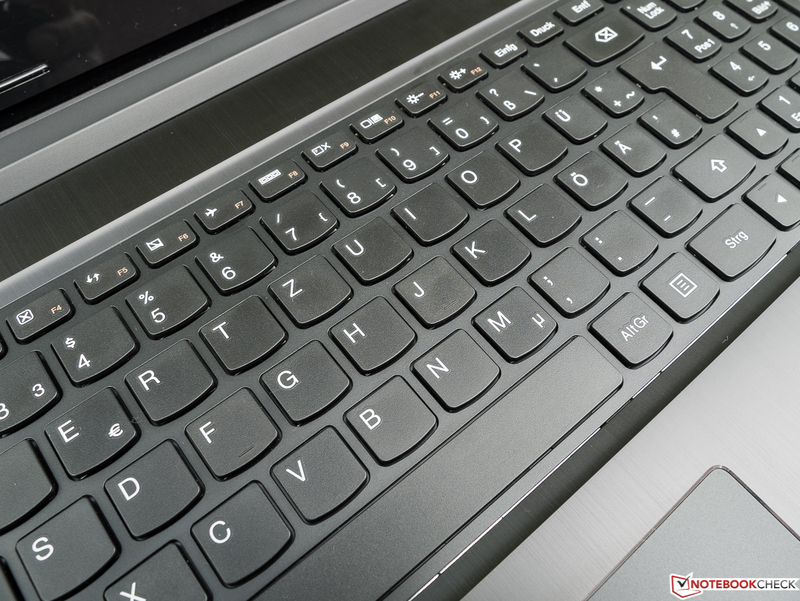 The author never reviewed a device before where it was so easy to push down the whole keyboard as in the case of the Lenovo Z50-70, which creates a cheap initial impression that is even enhanced by the large clattering keys. The rest of the keyboard does not win any awards, either. The travel is just okay, but the pressure point was too spongy and the stroke too hard in our opinion. 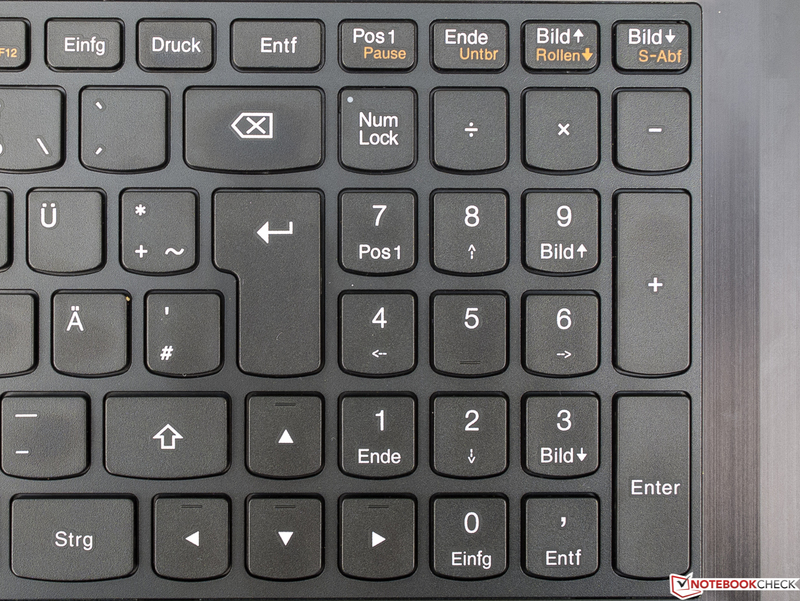 F1 to F12 can only be used via Fn key; the standard functions are typical special features like louder/quieter and darker/brighter. If you want to use the normal functions keys, you won't be happy about the tiny and low-contrast lettering. The layout, however, deserves praise: All keys are at their expected places; Shift and Ctrl are bigger (similar to desktop inputs). The key surface is roughened and slightly concave. 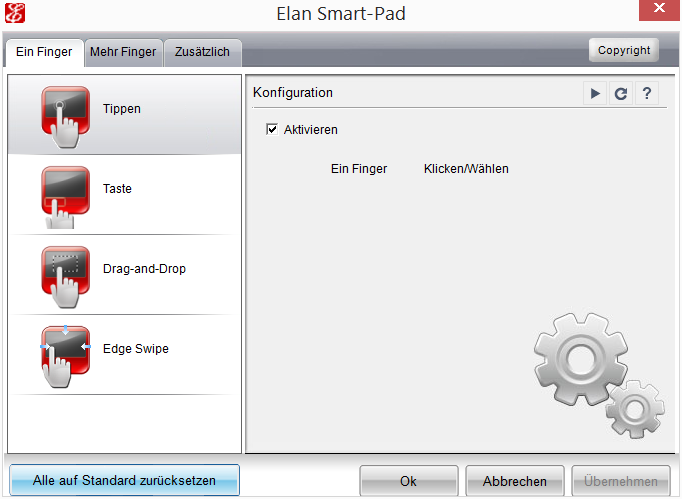 Right from the beginning we asked ourselves why the classic touchpad is not bigger when you consider the available space. The silver frame does leave a noble impression in return. The surface is not completely sensitive toward the peripheral areas, but it is slightly roughened, which is usually preferred by the author in regard to the feedback. However, in this case, at least subjectively, it supports the suboptimal gliding capabilities. Precision and response did not cause any criticism, and Drag & Drop also worked very well. The two buttons cannot really convince with their mechanics, they are too deep inside the case and offer too much resistance for our taste. The feedback is still okay but could be better. It also depends on the spot you press. Since the touchpad is too far on the left, you can hardly avoid any contact with your palm during gaming with the WASD keys. The two screenshots on the top right show the most important driver settings. The glossy 15.6-inch TN display (16:9) does manage a usable pixel density of 141 ppi thanks to the Full HD resolution – but that's all the good news. 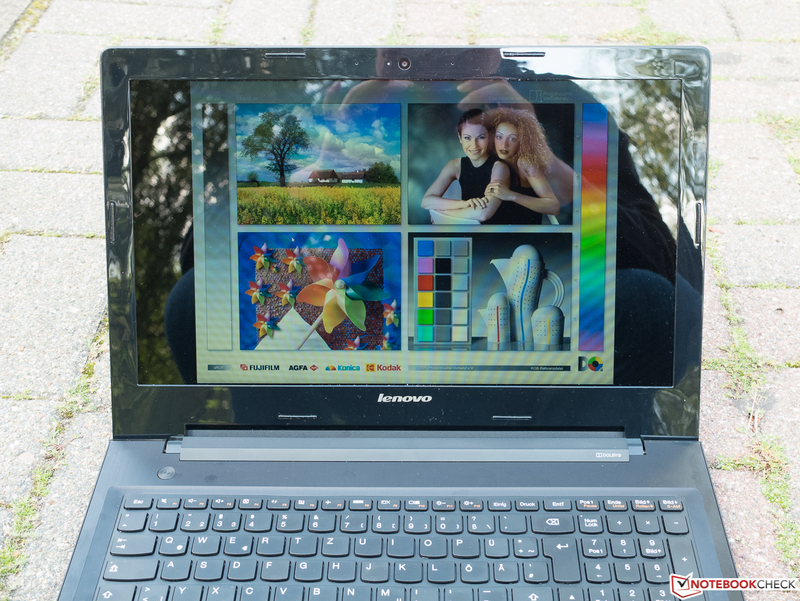 Certain combinations of fonts and background colors result in blurry pictures and the brightness of the IdeaPad only reaches 200 nits, which can be expected for an inexpensive notebook. 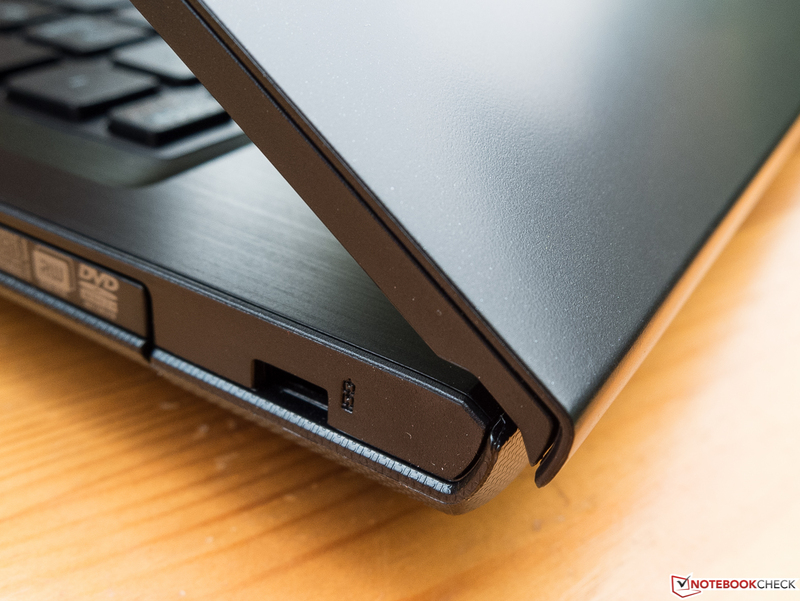 However, the less expensive Acer Aspire V5-561G manages a very decent 300 nits, but you get an unbelievably high black value of 1.29 cd/m² in return. 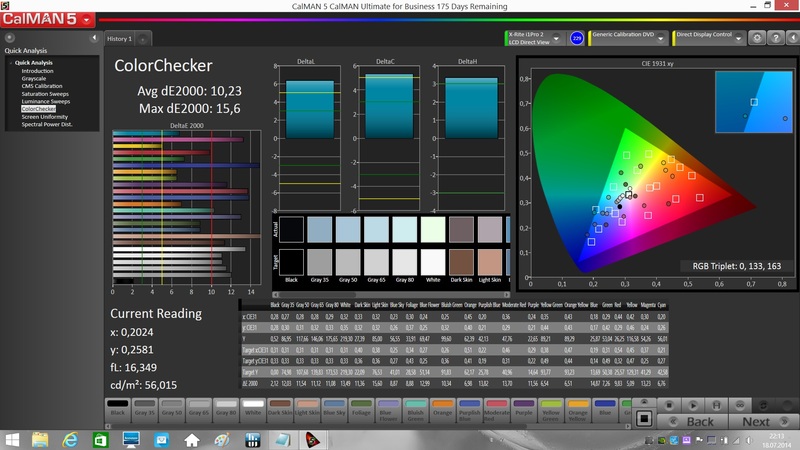 We cannot really say if the poor brightness distribution of 78% is noticeable in practice because of the catastrophic viewing angles – but more on that later. 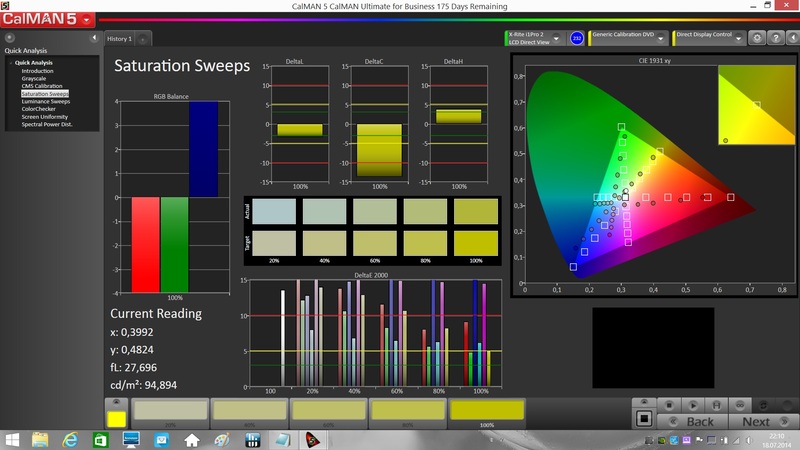 We could not determine brightness reductions on battery power. The average contrast ratio of 546:1 is not very good, either. The resulting black value of 0.37 cd/m² improves the weak overall impression a bit. 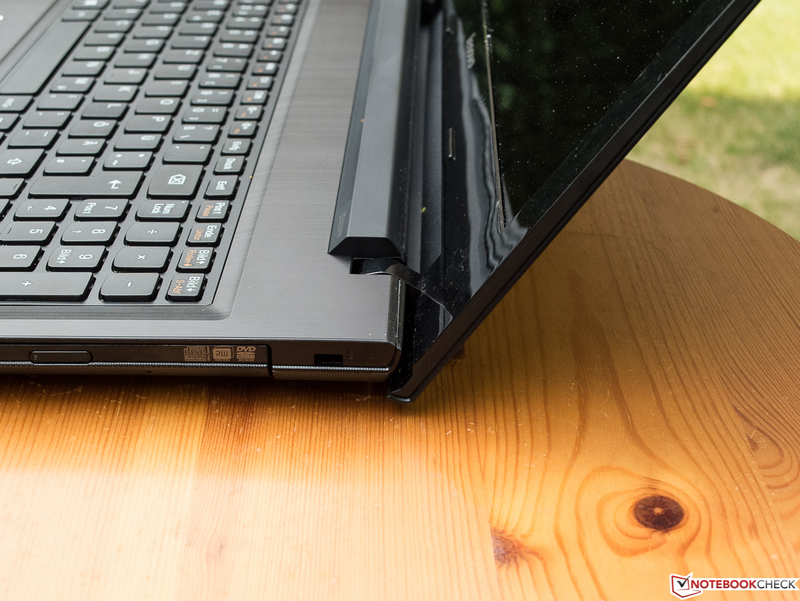 The MSI GP60-2PEi585 can score in this discipline and has a better display overall, but the screen is still just average. Another typical issue of TN panels is the low color accuracy that is represented by all three comparison devices with high DeltaE values of 7 and 8 (MSI), 10 (review unit) and an exorbitant 13 (Acer, grayscale). 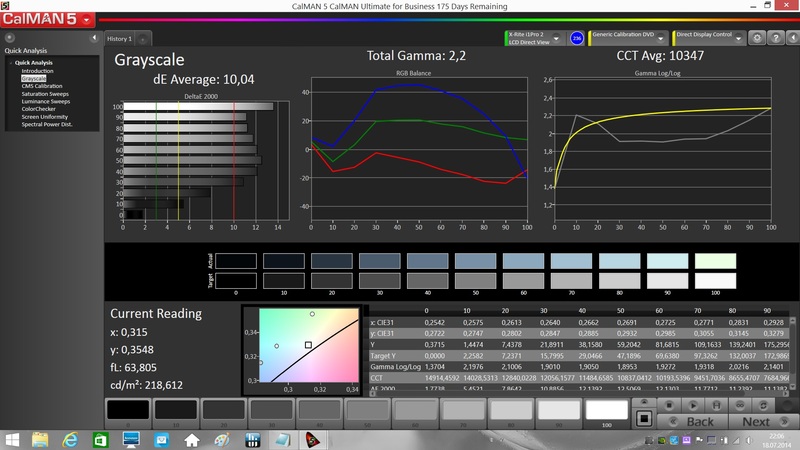 Our review sample also has a strong blue cast without calibration. 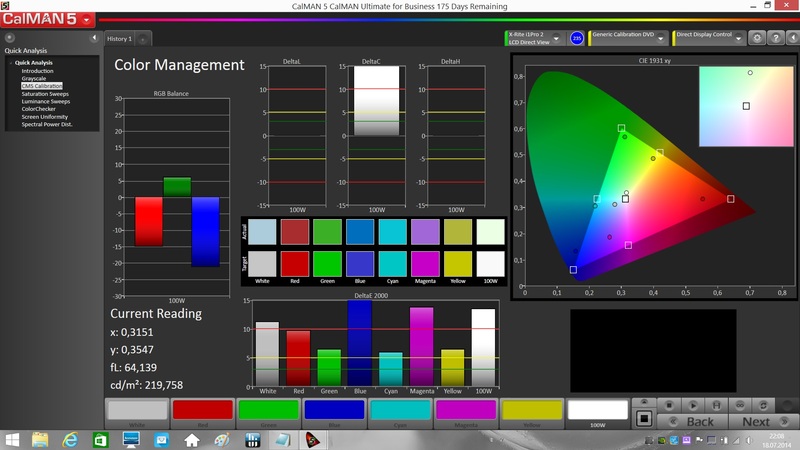 35% coverage of the large color space AdobeRGB, which is usually only important for professional users, is insufficient, even for a TN panel. It is astonishing that the MSI manages a very good 56% despite the TN panel. 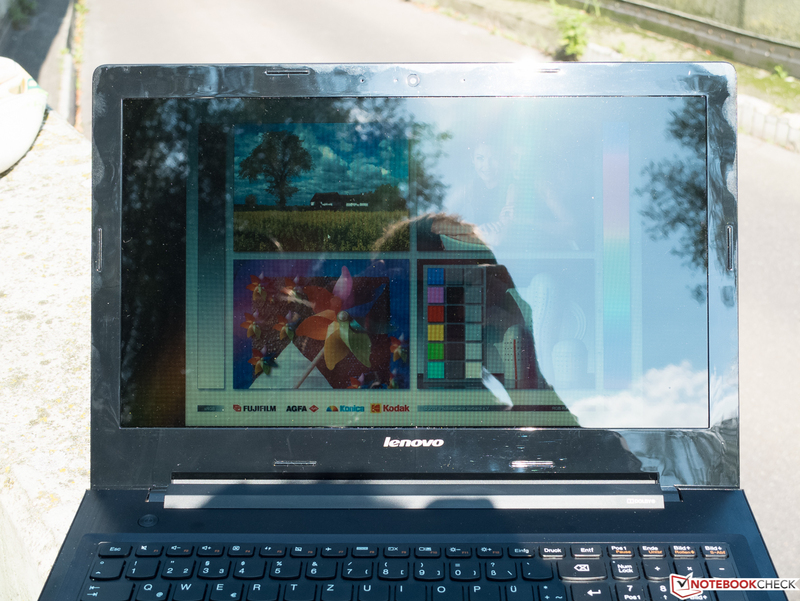 You cannot really use the device outdoors, at least on sunny days. It is even hard to find a position in the shade (third picture) where you can see the picture at all. This is the price of the very glossy and dark display. We already mentioned that the viewing-angle stability was so bad that we subjectively could not evaluate the black value and the brightness distribution. If you're looking on a completely black picture (RGB 0,0,0) directly from the center, you can only see black in the center area, the rest is dark gray. The dark area moves with vertical changes of the viewing angle. 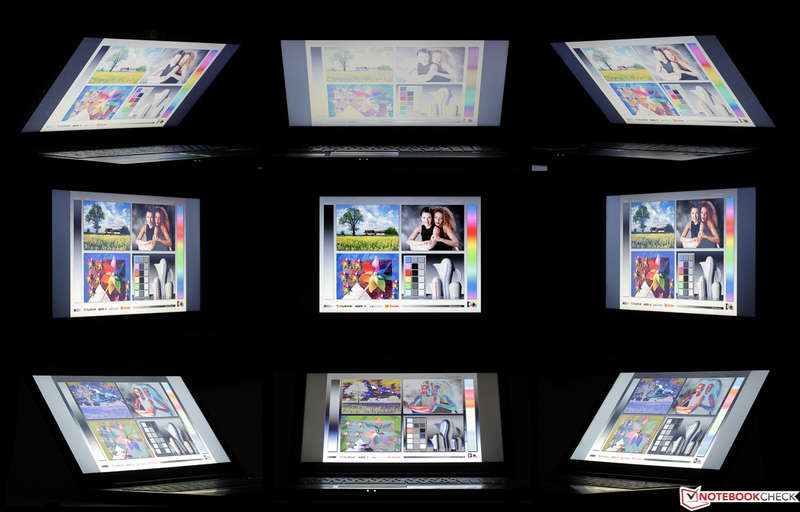 The typical picture distortions of TN panels with shifted viewing angles, like a milky impression from the top and inverted colors from the bottom, are very distinct in the case of this panel. 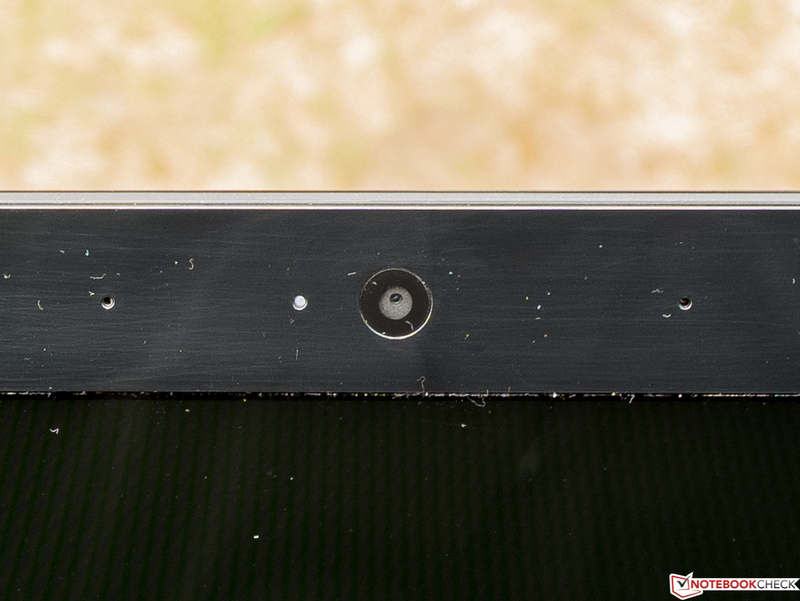 The viewing-angle stability is also much worse compared to good TN panels. 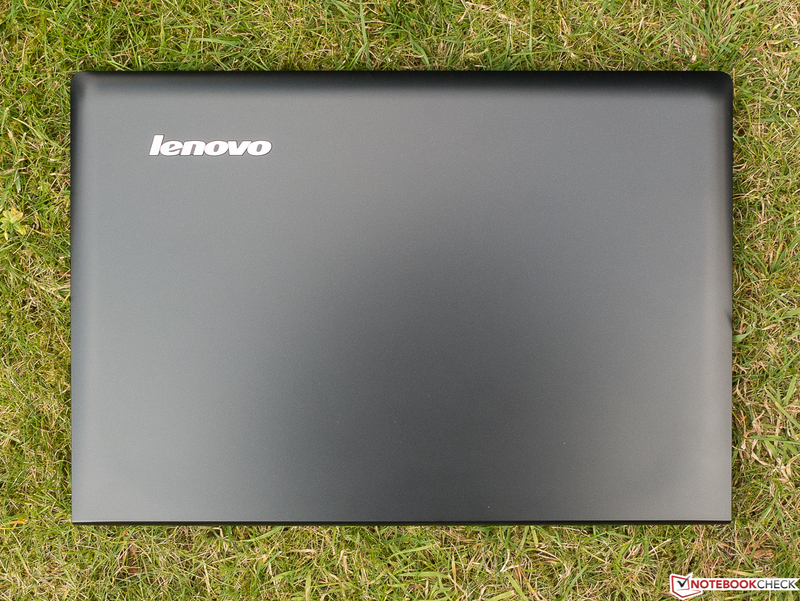 Our Lenovo IdeaPad Z50-70 is a typical mainstream multimedia notebook with a pretty powerful Core i7 CPU, which is accompanied by the mainstream GPU Nvidia GeForce 840M with 4 GB dedicated memory, which was just released in March 2014. This means the performance is not only sufficient for all office tasks, but also for real-time video editing or complex picture editing, for instance. Games are more limited by the GPU than the CPU, but you should be able to play even complex titles with 1366x768 pixels in medium, sometimes even high, settings. The Intel Core i7-4510U is a frugal 22 nm dual-core processor with a TDP of 15 Watts that can execute up to 4 threads simultaneously thanks to Hyper-Threading. It has a nominal clock of 2.0 GHz, but it can run with up to 3.1 GHz (Turbo) for a short while if one core is stressed and up to 2.8 GHz when both cores are stressed. 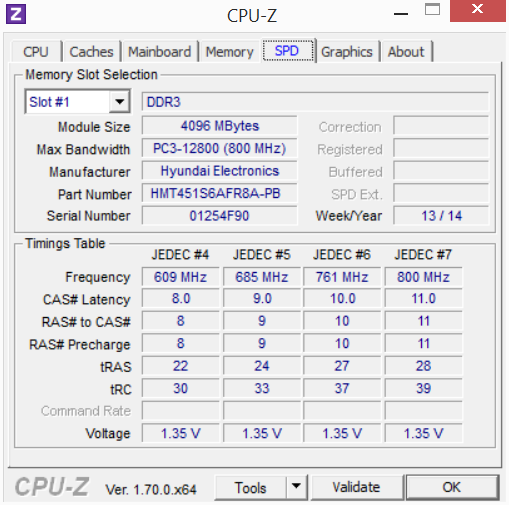 Compared to Ivy Bridge, the efficiency has been improved significantly, the per MHz performance just slightly. 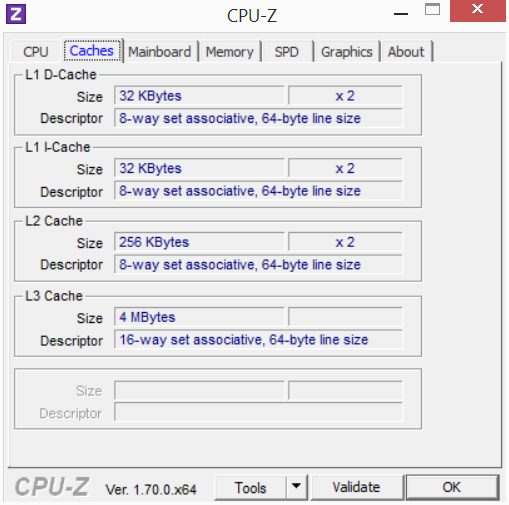 The additional performance can be quite big if the software utilizes the new instruction sets like AVX2. The integrated on-chip GPU Intel HD 4400 handles simple 2D tasks and supports Nvidia's Optimus technology that automatically switches to the dedicated GeForce 840M for more complex applications. 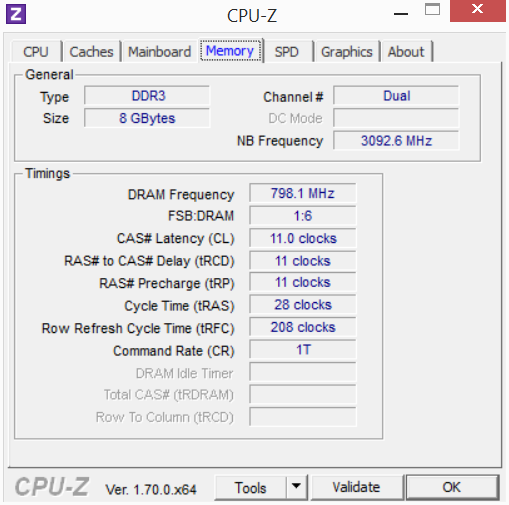 The specified maximum clock of 2.8 GHz could not be maintained during the Cinebench R11.5 Multi-CPU test and dropped to 2.6 GHz after around a minute. This is a pretty good result. All in all, the CPU shows the expected performance under load. 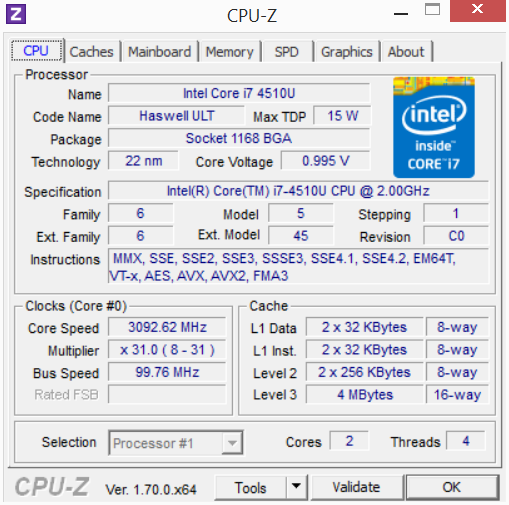 The differences to the faster i5-4200H (2x 2.8-3.4 GHz, Hyper-Threading, TDP 47 W) and the slower i5-4200U (2x 1.6-2.6 GHz, Hyper-Threading, TDP 15 W) in the two comparison devices are on the expected level as well. There should not be any performance limitations on battery power. Numerous additional benchmarks to this and many others processors are available in our FAQ section. 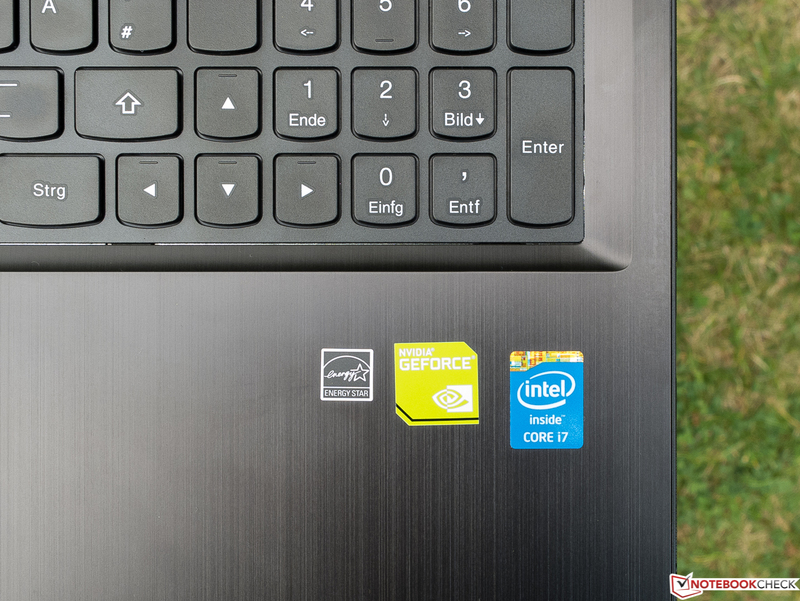 Whether the CPUs of the two comparison notebooks are faster (MSI) or slower (Acer) compared to our review sample – both rivals are more than 25% behind in PCMark 7 (overall score). 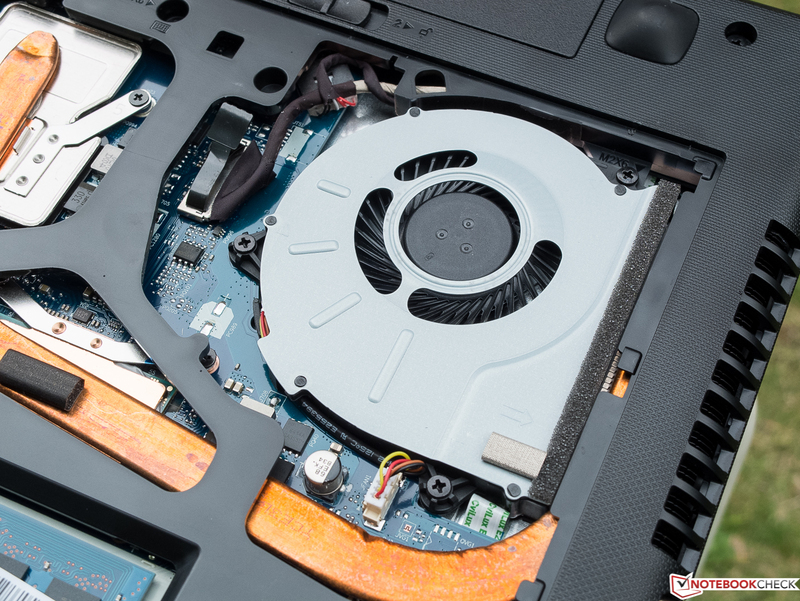 The difference of the Acer can be explained by the significantly slower graphics card and the missing SSD cache, but only the latter applies for the MSI, which is certainly not enough for a large difference. 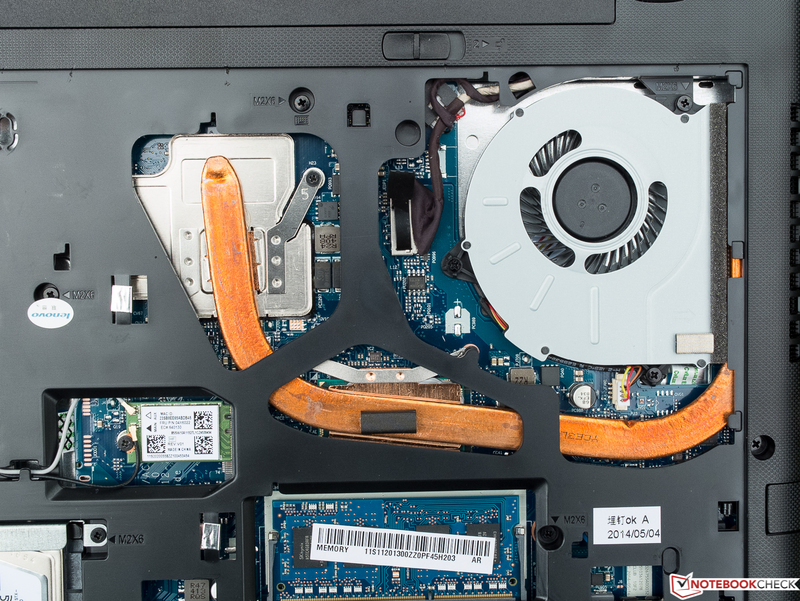 We added three other notebooks with similarly powerful CPUs and graphics cards to the chart to evaluate the influence of the storage solution. 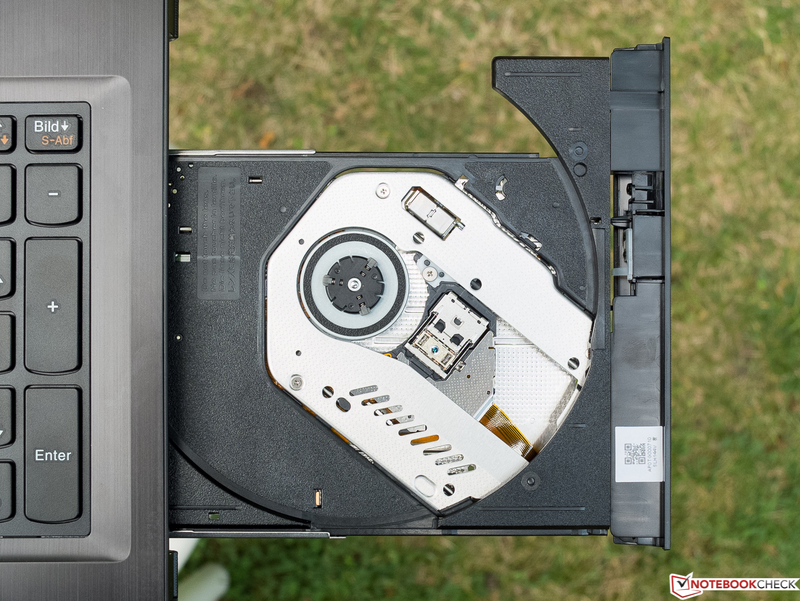 Two of these devices use conventional hard drives (Acer Aspire V7-582PG-74508G52tkk, Asus F550LN-CN89H) and one is equipped with a full SSD (Gigabyte U24T). The handling was subjectively very fast and the launch of frequently used applications really seemed to benefit from the SSD cache. 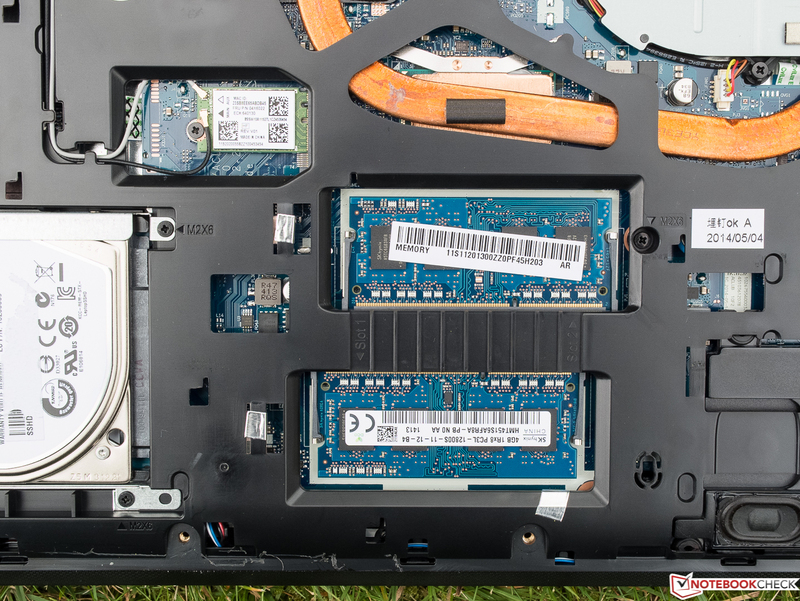 A real SSD would obviously enhance the performance even further. 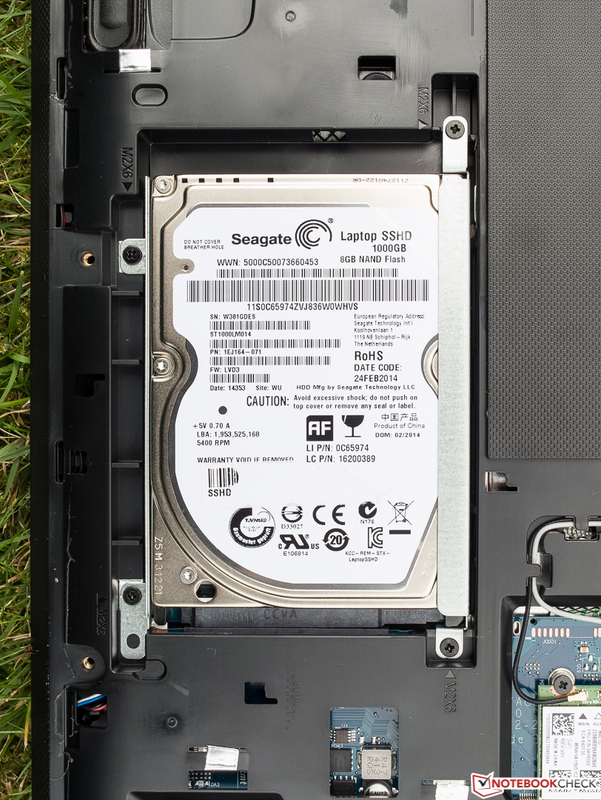 The storage solution of our review unit is a Seagate ST1000LM014 Solid State Hybrid Drive with an 8 GB SSD cache. The drive recognizes frequently used data and shifts them into the cache to improve the performance. 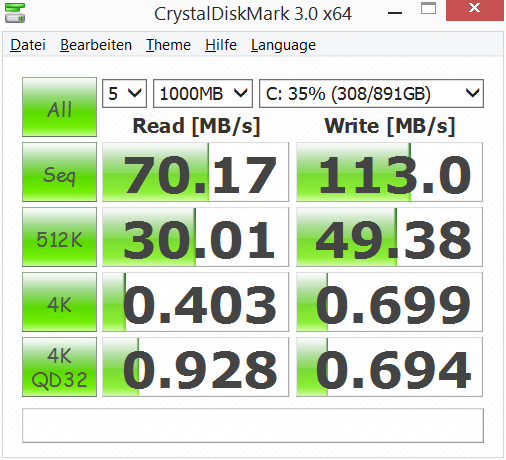 This should be noticeable with application launches and the boot time in particular, but it can create some erratic results in the benchmarks, and the same applies in this case: Despite three runs, CrystalDiskMark 3 only shows bad sequential read transfer rates of 55 up to 70 MB/s for the 1 TB HDD, whereas HD Tune determines more realistic, but still not good 90 MB/s. 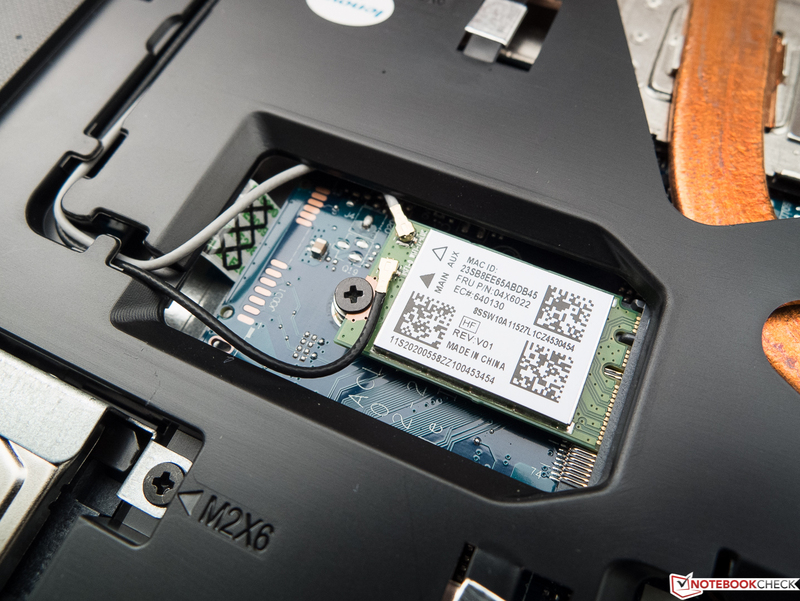 The same hard drive inside the Lenovo IdeaPad Y510p-59400120 manages 112 MB/s. 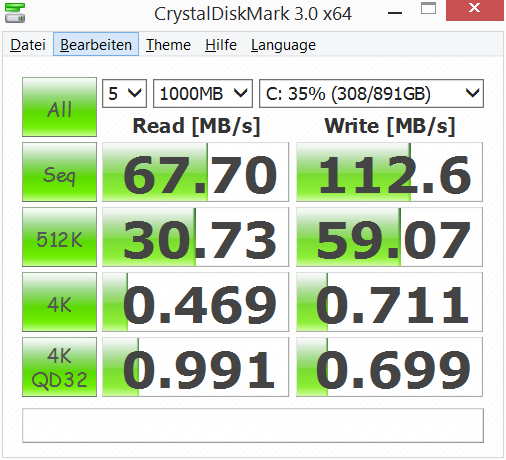 0.4 MB/s for small files in the 4k test is not even a good result for conventional hard drives; SSDs usually reach at least 20 MB/s. The Nvidia GeForce 840M is a mobile mainstream graphics card based on the new Maxwell architecture that supports DirectX 11 and has its own dedicated GDDR3 memory (no GDDR5 possible). Our review unit has 4 GB memory and a 64-bit memory interface. Despite the low memory bandwidth, the performance is, thanks to several architectural improvements, just slightly below the older GeForce GT 750M with a 128-bit memory interface and surpasses the direct and very popular predecessor GT 740M by around 30%. 3DMark 11 shows that the performance is still on the expected level, it only falls behind by 8% compared to current multimedia notebooks with the same graphics card. 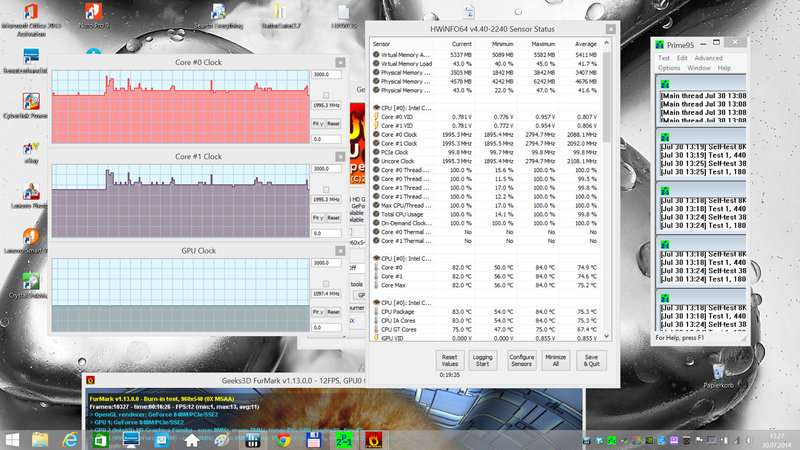 The newer 3DMark 2013 confirms this result. 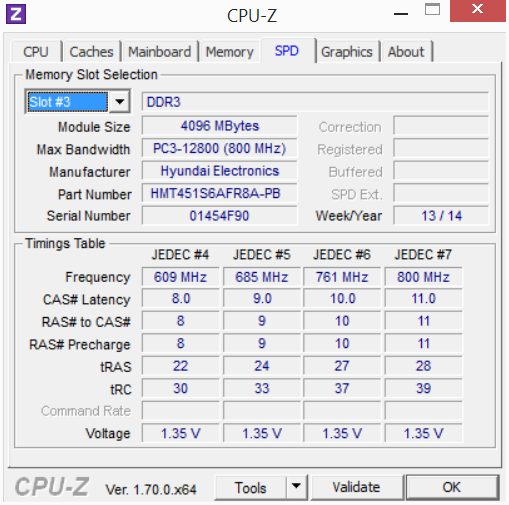 The MSI P60-2PEi585 with the same GPU is on the same level. The overall slower Radeon R7 M265 inside the Acer Aspire V5-561G cannot pull ahead anymore in the DirectX 10 benchmark Cloud Gate. 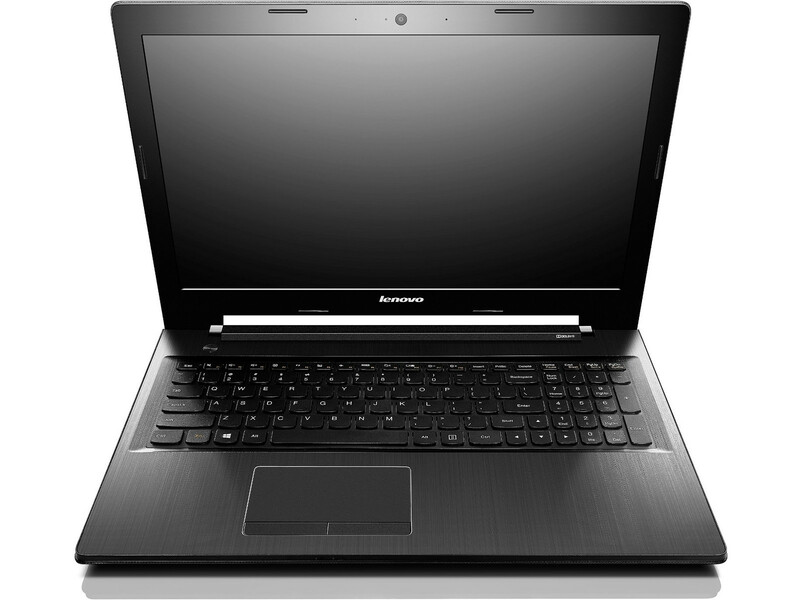 Current 3D titles like Thief or Crysis 3 cannot be played with the IdeaPad Z50-70 or only in the ugliest lowest settings with a resolution of 1024x768 pixels. Hitman: Absolution looks nice with medium settings in 1366x768 and just runs smoothly. This applies for some older 3D shooters like BioShock: Infinite as well. In this case and with other shooters like Dishonored that run on the older Unreal Engine, you can even play with high settings. 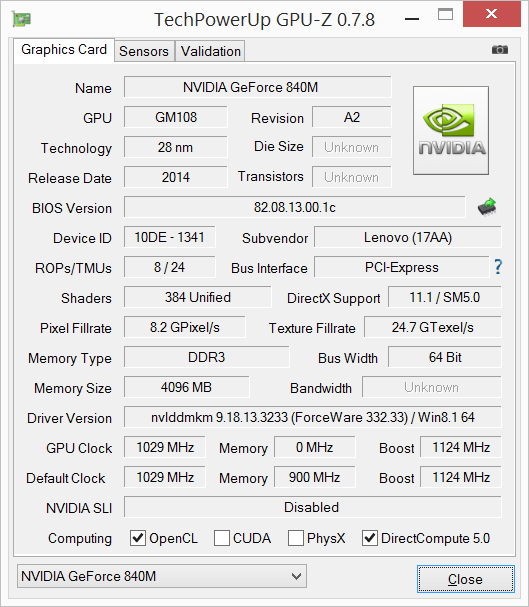 Games like Dota 2 or Diablo III are only a challenge for the GeForce 840M in the maximum settings. The performance was not reduced on battery power. Below the Verdict section is a small comparison between the graphics cards of our comparison devices. 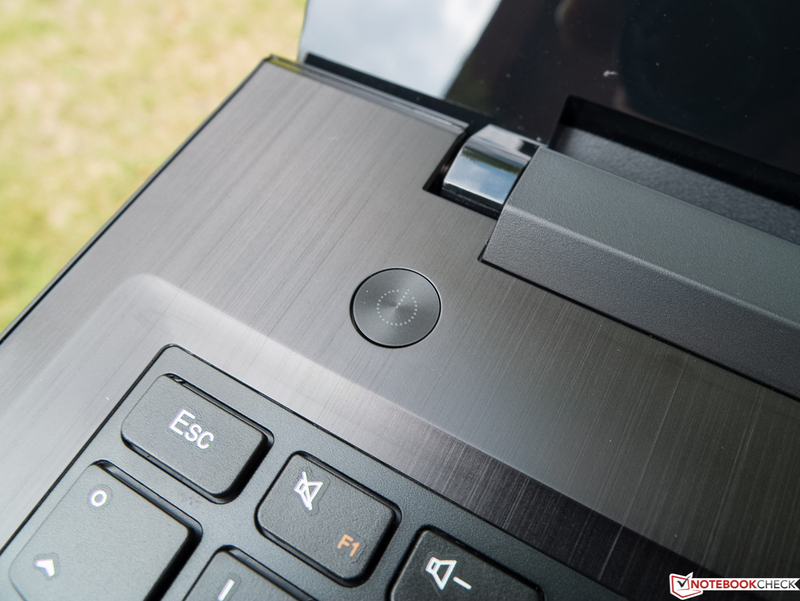 The Lenovo IdeaPad Z50-70 is never completely silent, but the noise from the fan during idle cannot be heard in a quiet environment; you have to get your ears very close to it. The noise under load is a slightly audible and gentle murmur that is not annoying. 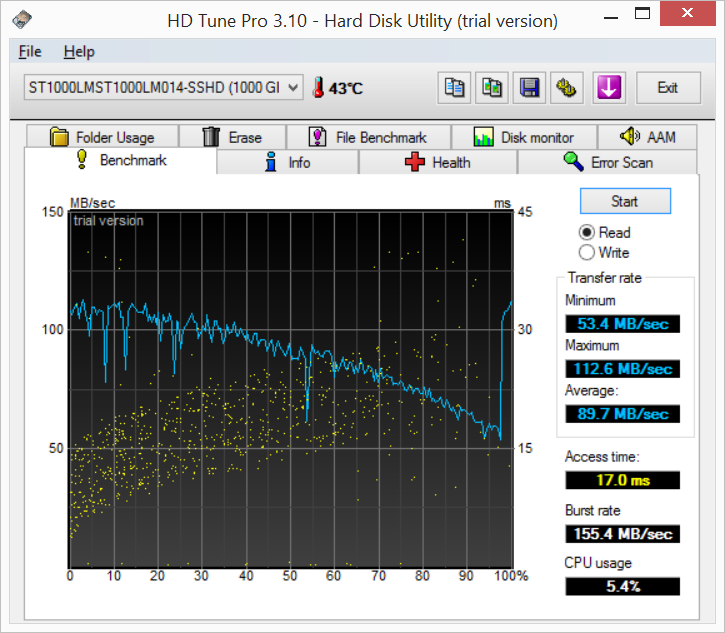 The two rivals in our comparison are slightly louder with light workloads, but only the annoying 50 dB(A) from the MSI under load is really loud. There should not be any problems with the review unit if you want to play games in noise-sensitive environments (with headphones). The surface temperatures are never a problem during web browsing or standard office tasks. Gaming on the lap is basically possible since the heat is dissipated at the left side of the case. The fresh air is sucked in via slots at the bottom. Continuous maximum load results in 45 °C in the area of the fan exhaust at the left side. Whether that is annoying is pretty subjective. 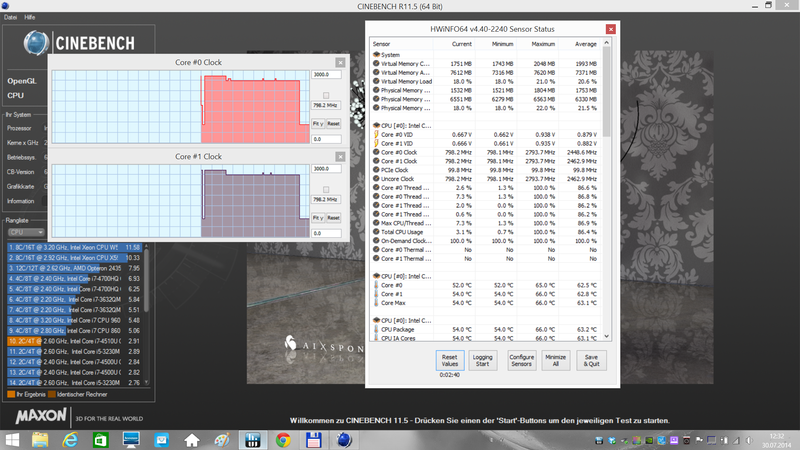 The two CPU cores only run above the nominal clock of 2.0 GHz for a couple of seconds during the CPU stress test with Prime95, but it hardly drops below it, so there is no throttling. 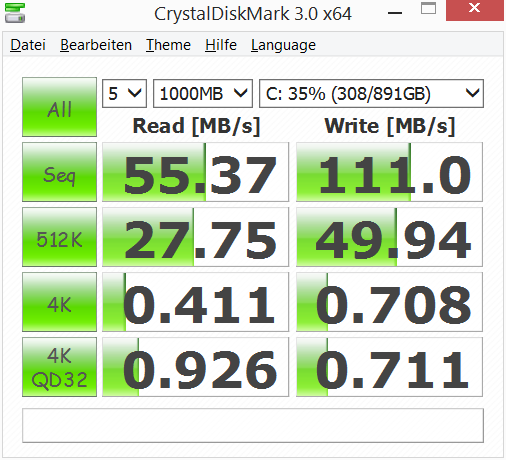 This does not change with additional load for the GeForce 840M from FurMark. 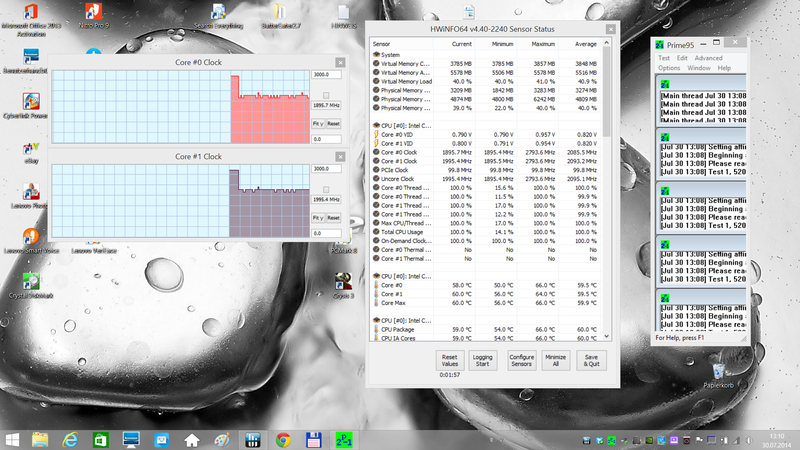 The GPU clock is at 1.1 GHz in this situation, which means that the Turbo is well utilized. The Dolby software only makes it worse. The speakers do an average job and direct the sound to the front and the bottom. 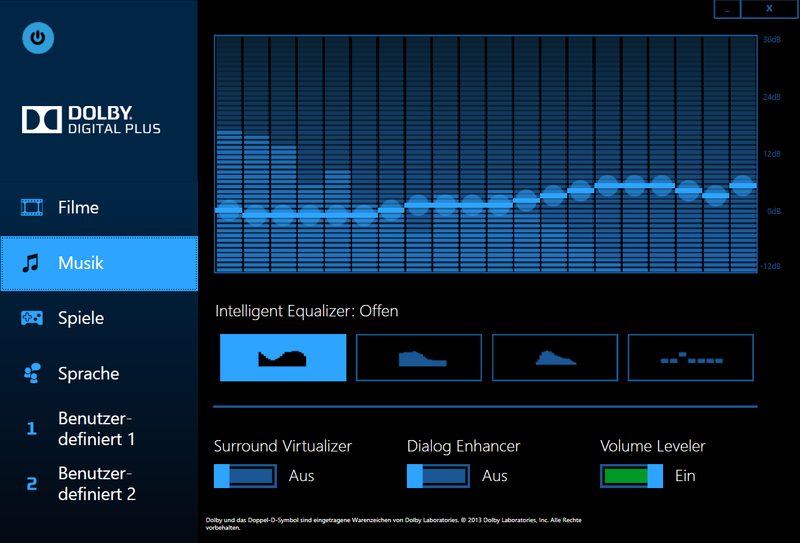 The sound is completely free of bass and too focused on the medium and high tones. The maximum volume is sufficient for a 30 m² room and does not result in distortions or volume fluctuations. If the notebook stands on a table that can be used as a resonance body, the sound is louder and richer, but depending on the source also a bit tinny and shrill. Many instruments playing at the same time can hardly be differentiated. The speakers at least manage to create a certain spatial sound. Voices in movies are easy to understand. You should not use the sound profiles of the "Dolby Digital Plus Home Theater" (see screenshot), "Off" is usually the best setting and we also used it during our review. 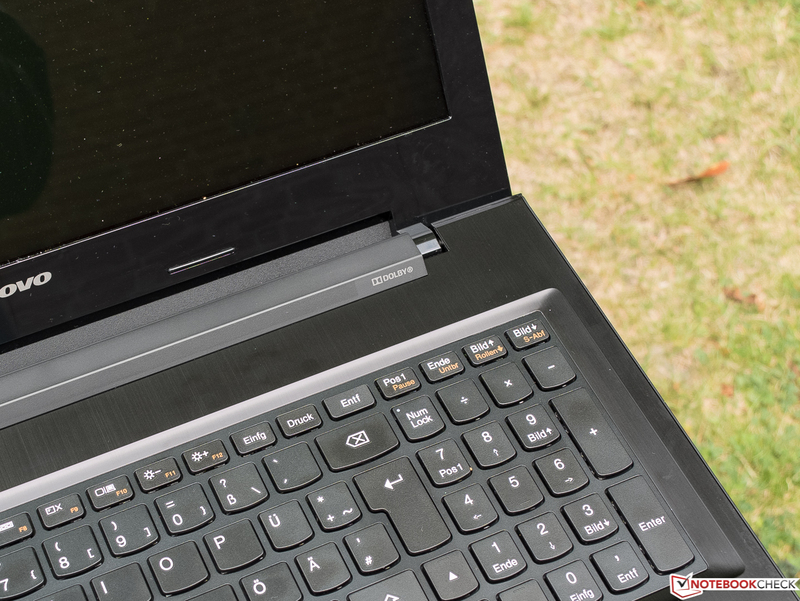 We use similarly sized multimedia notebooks that we reviewed in the last 12 months for the comparison of the consumption and the battery runtime. For starters, the power consumption of 0.1 Watts when the device is turned off and 0.2 Watts during standby cannot be criticized. 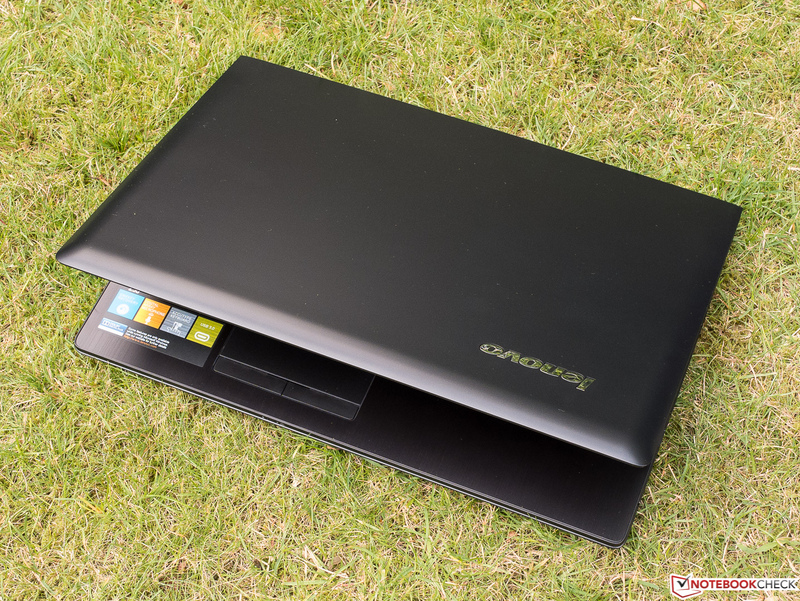 Looking at the idle (average) result, the Lenovo is among the 4 most frugal devices. The MSI with its 47 Watts TDP CPU, which consumes more power in general, is only average in this scenario with 10 Watts more. The 65-Watts power adaptor is just sufficient. Mobile gaming with the Z50-70 in this configuration is probably possible for one to one-and-a-half hours. More interesting is the realistic WLAN test, which runs a script that opens different webpages with deactivated consumers and an adjusted brightness of 150 nits. 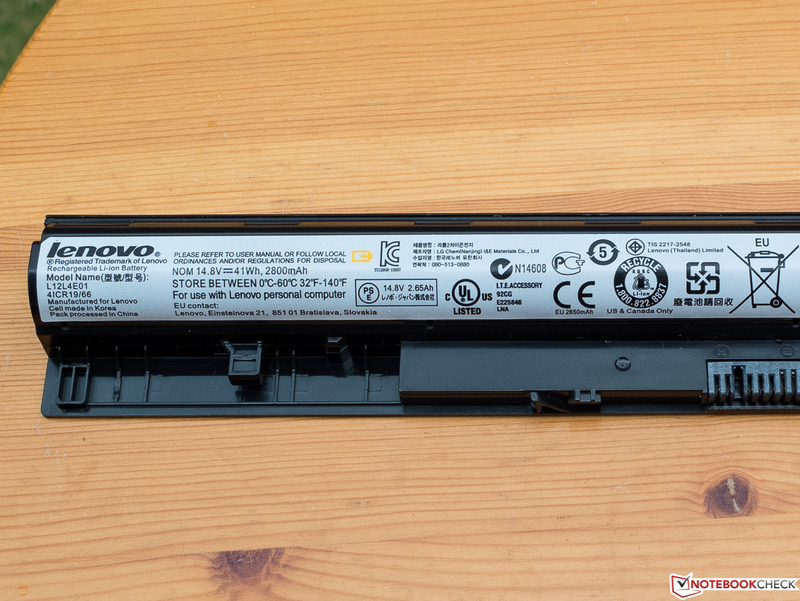 The runtime of 281 minutes is an average result, but you have to consider that the battery only has a pretty small capacity of 41 Wh (MSI, 49 Wh: 170 minutes; Acer, 37 Wh: 212 minutes). Unfortunately, the answer to our initial question is no. 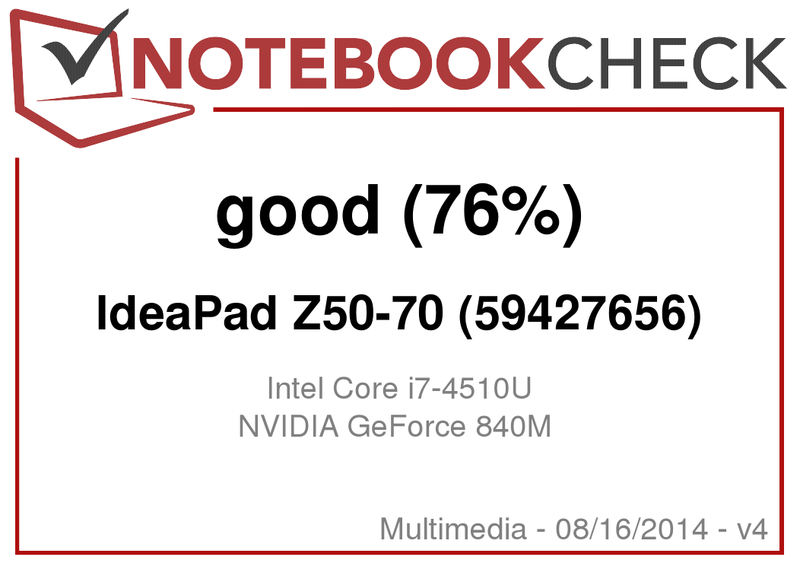 In terms of hardware components there is no criticism about the Lenovo IdeaPad Z50-70 (59427656): The performance is decent, and the convenient thermal management results in a quiet and cool operation. That is all about the inner values. 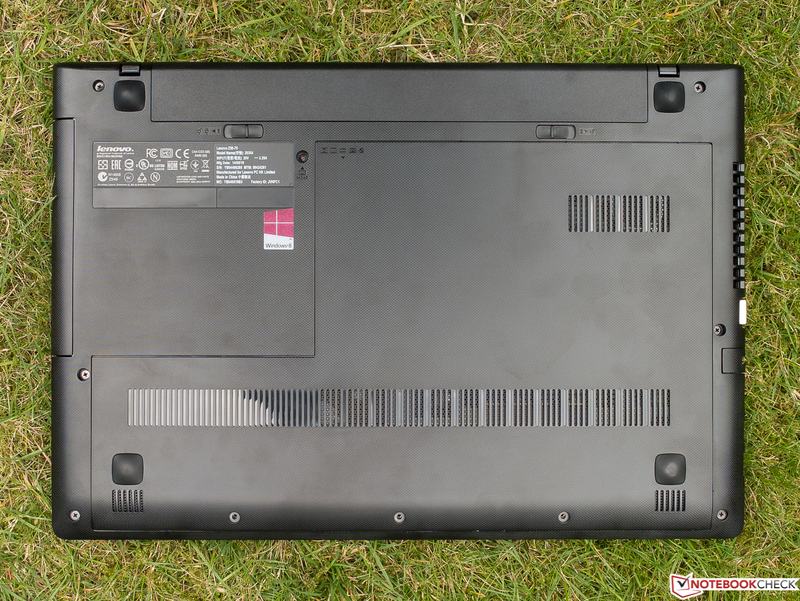 Looking at the rest of the notebook, you quickly ask yourself where Lenovo got these bad parts when you type on the keyboard or look at the display, and why the manufacturer did not integrate a better TN panel at least for the medium-priced configurations. The case is nice to look at, well-built and most rivals should take the Z50-70 as an example in terms of maintainability. But the meager port variety once again shows a basic issue of the review sample: The good hardware components result in a high price, but the other parts, which are shared with the less expensive versions, just cannot meet the expectations of this price point. We have a problem with a purchase recommendation, because there are devices in the same price range that offer a better overall package. 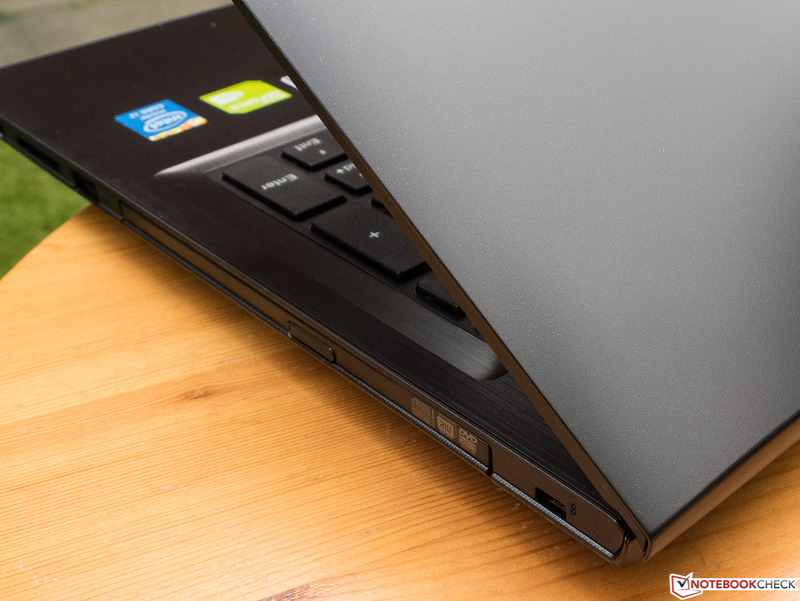 One example besides the two mentioned rivals in the review would be the brand-new Acer Aspire V5-573G-54218G1Taii, which got 82% in our review. It has a better GPU and a slightly slower CPU, a matte and bright IPS display with accurate colors and good viewing angles as well as better battery runtimes. It is also thinner and lighter than the Lenovo, but much warmer and a bit louder under load in return. 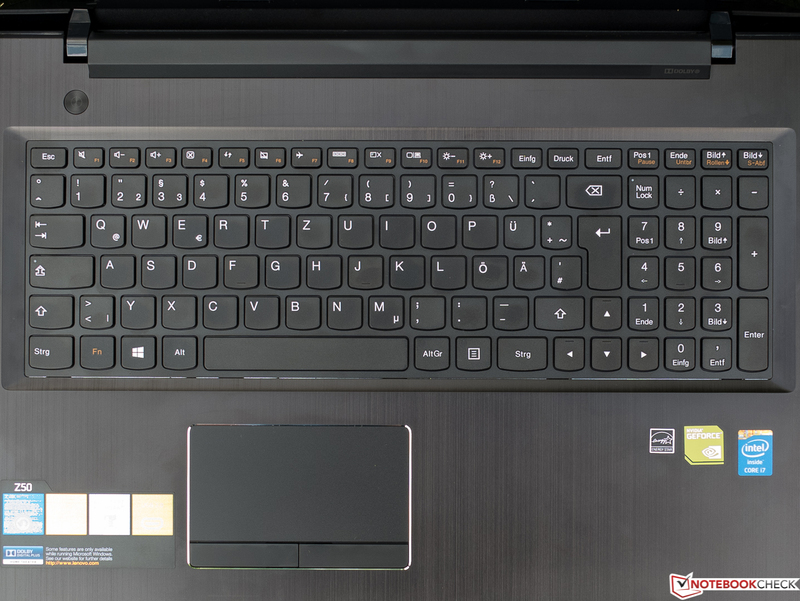 You will also have to waive a maintenance cover, but we did not have any issues with the input devices (illuminated keyboard) during our review. In review: Lenovo IdeaPad Z50-70. Test model courtesy of Notebooksbilliger. ...while the top of the base unit looks like brushed metal. ...500 Euros (~$662) version of the Z50 series. ...the correct description for the design. It is very tricky to see the small orange-colored lettering of the FN keys. The maximum opening angle is around 130 degrees. Webcam, microphones and light sensor. 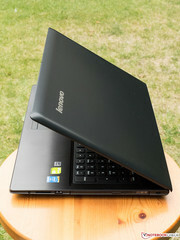 The performance meets the expectations and the notebook stays cool and quiet. Better input devices would have been nice. 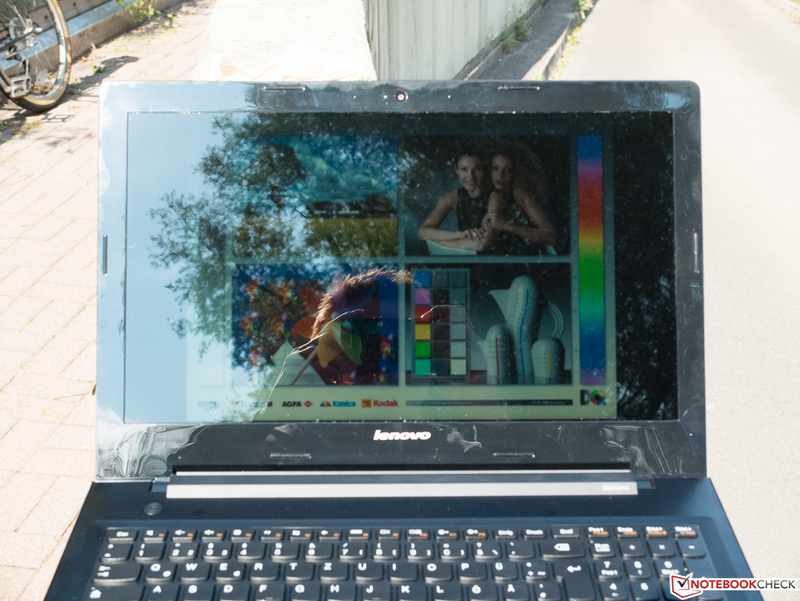 Where did Lenovo find this questionable display?